It was a little more than two decades ago that Beverly Daniel Tatum, a psychologist and educator, published Why Are All the Black Kids Sitting Together in the Cafeteria? Based in part on her experiences teaching college courses on the psychology of racism, the book explored the often-veiled dynamics of race in America and the complexities—and importance—of racial identity development. The book was a national bestseller and struck an immediate and lasting chord with educators, becoming a guiding text on diversity and multicultural understanding in schools. (It was reissued in 2017 by Basic Books with new and updated material.) We recently spoke to Tatum, who is now president emerita of Spelman College in Atlanta, about race and schools today. Do you think today's students of color are facing new challenges in developing positive, internalized racial identities? There's a lot going on in our society today that complicates racial identity—there's no doubt about that. But one of the biggest issues for many students of color is that our schools, 65 years after Brown, are nearly as segregated as they were at the time of the ruling—for different reasons, perhaps, but segregated nonetheless. Nearly 75 percent of Black1 students attend so-called majority-minority schools, and 38 percent attend schools where 10 percent or less of the students are White. The numbers are similar for Latinx students. And both Black and Latinx students are more likely than White students to attend schools where 60 percent or more of the students are living in poverty—so you have concentrated poverty in many schools. And these schools are likely to have higher teacher turnover, less experienced teachers, and inadequate facilities and resources. Separate is still unequal. Now when you think about young people's identity development, that's shaped in part by where you go to school. The social context you're in is going to have an impact on how you think about your future and who you are in the world and where you fit in. There are lot of factors at play, but if you're a student in an under-resourced, segregated school, you might certainly feel devalued. You might wonder why the resources and opportunities available to other kids are not available to you. On the brighter side, media representations today are becoming more diverse. There are images and representations of young Black youth that are more positive than we saw 20 or 30 years ago or certainly 65 years ago. Black Panther and the new animated Spider-Man movie are examples of this, both featuring heroes of color. Such portrayals can be very affirming for young people of color. That said, there are still plenty of stereotypical representations out there, and of course we haven't even talked about all the current criminal justice concerns that have become so visible. What about for White students and educators? Are there factors today that might make it difficult for them develop holistic racial identities—to be more racially aware and social-justice oriented? Here's a statistic from the 2017 edition of my book. According to a survey conducted by the Public Religion Research Institute in 2013, 75 percent of White adults in the United States have entirely White social networks, without any interaction with people of color. So if you're a kid in one of these families, you're likely to be going to school where there are few people of color. And if you are growing up in a largely White community and going to a school without much racial diversity, then most of what you know about people of color is coming to you secondhand. It's often coming from media images, and a lot of that consists of stereotypes. In the end, all this just reinforces the sense that Whiteness is the norm. White adults might not use the overt language of White supremacy in their conversations, but that's the embedded idea, even if it's not explicitly stated—that our school is better, our neighborhood is better, we are better. There's an internalization of goodness associated with Whiteness that is just part of daily life. You might not be consciously thinking about it, but it's there. It's tough to become a change agent in that context. In my experience as an educator, a lot of young White people don't start thinking about racial issues until they get to college, because college is often the most diverse learning environment they've been in. In that more diverse context, we can try to build the skills and understanding that they didn't get in elementary and secondary school—through courses like mine on the psychology of racism or discussions of books like Baldwin's If Beale Street Could Talk in English class, which bring attention to the level of injustice experienced by people who are targeted by racism. Frankly, it sometimes seems remedial at that point, but it's often our last best opportunity, outside of the military, to help young adults figure out how to live effectively and cooperatively in a diverse society. What advice would you have for educators who want to create more affirming environments for students of color? Think about representation. I often use this analogy: Imagine we're in a meeting and somebody is going to take a group photo. And at the end, we're each going to get a copy of that photo. What's the first thing you're going to do when you get your copy of the photo? You're going to look for yourself, of course. Our learning environments are like that, too. Students enter these environments and they look for themselves. And some students can find themselves easily—they can see themselves in the reading material, they can see themselves in the person standing at the front of the classroom, they can see themselves in the history they're learning. But there will be some students who rarely, if ever, see themselves. And to take the analogy a little bit further: Once you find yourself in the photo, the next thing you're going to do is consider how you look, right? Are your eyes open? Is your tie straight? In the same way, every student wants to see themselves not just in the picture, but in the picture looking good. So we have to think about who sees themselves in the curriculum and materials we use in the classroom—and how. Who sees themselves on the walls in the school? Who sees themselves in the discussions we're having in class? And if the only time Black kids see themselves is when we're talking about slavery or the ways Blacks were mistreated—during the Jim Crow era, for example—that's a case where, sure, they're in the picture, but they're not looking good. So it's a matter of providing different perspectives. Even if we are teaching about slavery, are we talking about slave rebellions? Are we talking about resistance? Are we talking about the agency of enslaved people in that narrative? The good news is that there are a lot of resource materials that can help teachers tell a fuller story. Facing History and Ourselves has some excellent material on Reconstruction, for example, as well as contemporary issues. 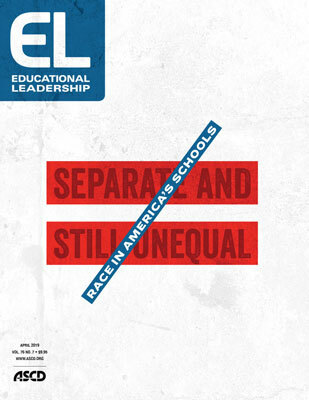 Teaching for Change and Southern Poverty Law Center are other organizations that offer resources that can help teachers provide greater balance and depth. Unfortunately, my experience is that, when it comes to teaching about racial issues, a lot of teachers are afraid of doing the wrong thing, so they choose not to do anything. But silence is not a helpful choice. What advice would you have for a school leader who wants to open up dialogue and help teachers work on these issues? I would certainly advocate for more professional development. But that doesn't necessarily mean you have to wait to invite a speaker or consultant to come to your school. You could start with a book club where you're reading a book on race and society and the teachers are talking to each other about how they're approaching these sensitive issues. Teaching can be quite isolating, so it's good to bring people together in discussion. I've worked in schools where they've created learning communities in which people are reading together and talking about what they read and maybe debriefing each other after their classroom lessons. That can be really helpful. But I think we should also assume there's a need for self-education, for both leaders and teachers. Understanding issues of race and racism and how they play out in the classroom is essential for educators today. In addition to my own book, I would highly recommend White Fragility by Robin DiAngelo. It can help teachers think about not just what's going on with kids of color, but also how we can better educate White students so that they are able to function effectively in an increasingly diverse society. Another book I've been recommending recently is Bandwidth Recovery by Cia Verschelden, which looks at the cognitive toll that racism and poverty and other forms chronic stress has on students. It also discusses classroom practices that can increase students' sense of belonging, which in turn increases motivation and academic achievement. You mentioned that many educators feel discomfort about talking about issues of race. How can they get past that and work toward becoming emissaries of interracial understanding in their schools? What I would say is, if you wait for perfection, you'll never do it. Everybody has to start somewhere. And if you can, join or form a learning community that's focused on these issues. If you have the support of a learning community, when you make a mistake, you can say, "Hey, this question came up in class—this is how I handled it, but I'm not sure that was the best way. What would you have done?" With conversations like that, we can grow together, and that helps reduce some of the anxiety. Do you have any thoughts on how patterns of school segregation could be interrupted? These patterns, which stem from residential segregation, are deeply entrenched in society. Desegregation solutions like school busing have fallen out of favor. So to be honest, I don't exactly know what can be done from a policy standpoint. But we do have survey information showing that, in general, many parents value the idea of diverse learning environments. They would like to send their kids to diverse schools. So I think that's one of the big questions we need to ask. If we think this is important, what are we willing to do to make it happen? 1 The terms Black and White are capitalized in this article in accordance with the interviewee's preference. Anthony Rebora is the editor in chief of Educational Leadership.